That was the question running through my mind as I called Bingo again with sixty of the meanest people I ever saw. If I am ever going to go berserk in public, it will be at the aptly named Leisure Living. Now don’t get me wrong. I love older people. I used to hang out with my grandparents and friends when I was a kid. And hey, I’m no spring chicken, myself. I went to Florida and rode my grandmother’s gigantic tricycle around the well-manicured trailer park. Their friends shook metal wind chimes at me as I rode by. (Gimme a break, I was eight.) Most of my career in healthcare involved working with those of a certain age, who are the largest customers of the business. But the folks at Leisure Living, oh my, they don’t make me feel the concept of leisure. I arrived 30 minutes early to set up. Everyone was waiting for me at round tables, with cards, beans, and lucky charms lined up in front of them. Let me repeat this for the uninitiated to the octogenarians and their serious sport of Bingo. All sixty people were there waiting for me and ready to go THIRTY MINUTES BEFORE THE SCHEDULED START TIME. I set out today’s prizes and someone called to me, “What did you bring today?” Volunteer callers bring about 20 gifts from the dollar store for individual rounds and then a “grand prize,” a $10 gas card or McDonald’s card. As I reviewed the prizes — a bird feeder, sugar free candy, hand lotion, nail clippers, work gloves, etc. — a group of women came up front to handle and inspect each item. There was much grumbling among the patrons. She said, “I don’t care.” Random Female Octogenarian # 1 put the “crap” back on the prize table, and returned to her seat. Now it is ten minutes until two, but this event cannot start soon enough because that means it will be over sooner. Something tells me I won’t be asked back. I start and focus — hard — on getting it right. This is my fourth time at Leisure Living and I’m getting better. Or so I thought. The group decides to play ten rounds of two games each and then a “cover-all” for a gift card. I explained that I only have one gift card, and if there is more than one winner, we’ll draw for the card. In the very first game, there’s a tie. What to do? These folks are verbal. I think most of them shout out that they agree. Instead I say, “Mob rule” and move on. It’s a good thing Leisure Living doesn’t have a Bell Tower or I might be scaling the walls. The board where I place the balls after calling them has holes on different sides of the numbers. This is very confusing for me, as I’m terrible at sequencing. As a visual learner, I picture letters and numbers in my head in order to put balls in the correct hole. In the first ten minutes I drop a ball twice which confuses me from my task, and nets a number of evil stares from 120 eyes and comments from some of the 60 mouths. “This isn’t ping pong, honey.” Honey? Well, at least maybe they like me a little. Nearing three p.m., time for “cover-all.” Whoever covers an entire card first wins a fabulous ten dollar gift card to a local discount store. “Cover-all” seems to last forever and will be the death of me. Every time I call that game, the bin is almost empty by the time “we have a winner.” You can feel the tension build in the room — these folks take this seriously. As the the wire bin empties, you could hear a pin drop in the room. All eyes are upon me. In a perverse way, I sense my power. “Speed ‘er up, why dontcha?” comes a call from the back. Now I can’t help myself. I’m being a rebellious child, and I slow down more. I slow down until there is an awkward pause between each number. It’s the kind of pause that starts to make people feel uncomfortable. Am I starting to lose it? Am I a control freak? Maybe I just want to go out in style, knowing this is my last visit. Did this make you laugh? If so, take a minute and share on your social media. If you like what you read, there’s more here Books by Amy Abbott. Through no fault of my own, I once found myself at a bingo hall. Someone yelled, “bingo.” People grumbled and threw their sheets into thrash bags. Soon, we all heard, “That was not a good bingo. We continue.” Players grumbled and retrieved their sheets Then again, “Bingo.” Players once grumbled and threw their sheets into thrash bags. 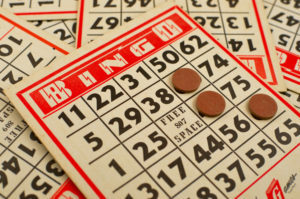 Soon, we all heard a second time, “That was not a good bingo. We continue.” Players grumbled louder, retrieved their sheets and smooth them out again. I really think there would have been a riot if there had been one more false bingo. Bingo is not for the thin-skinned. Those people are serious!